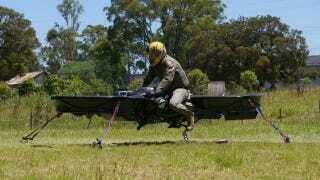 Marty McFly’s hoverboard is a cool piece of scifi fantasy, but I’m more excited for this hoverbike to hit the skies. And there’s a good chance that will happen now the US military is getting involved. At this month’s Paris Air Show, UK startup Malloy Aeronautics and the US Department of Defense announced plans to make this drone-like bike, a vehicle we’ve loved for many years, a reality. The US Army Research Laboratory in Maryland will work on the project. Malloy Aeronautics has been working on this bike for a few years, and describes its many advantages in combat: The rotors are shielded for extra safety, it’s more agile than a helicopter, can be folded up making transcontinental shipping a cinch, and also carry supplies in unmanned flights. Oh, and it basically looks like a speeder bike zipping around the forest moon of Endor. There doesn’t seem to be set timetable for when we’ll see these floating wonders in action, but development is set to begin soon in Maryland, according to Malloy. These wheel-free bikes will most likely act as reconnaissance vehicles (for now), but man I’d love one to ride to work.